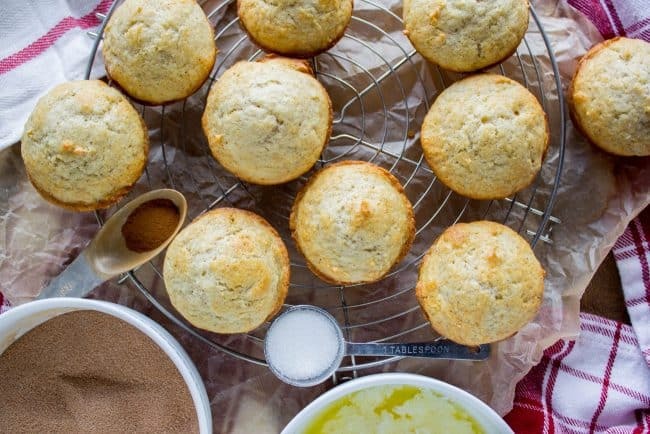 Raise your hand if you’ve tried these muffins!! The first time I had them was in college when Sarah would make them all the time. It’s an absolute classic (that I had never had before!) If you go to the original Betty Crocker recipe, you can read comments from ladies talking about how they made this in Home Ec back in the 70s. It’s been around a while! They are called French Breakfast Puffs but I don’t really know why. 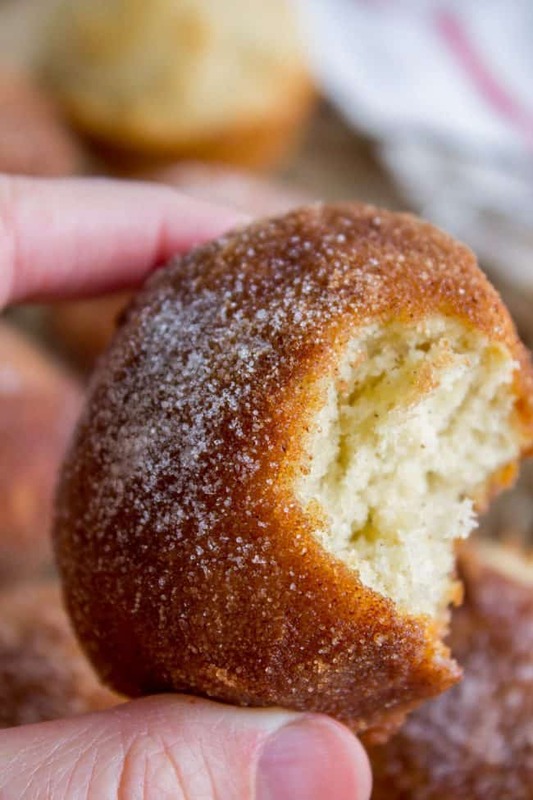 They’re basically Snickerdoodle muffins. 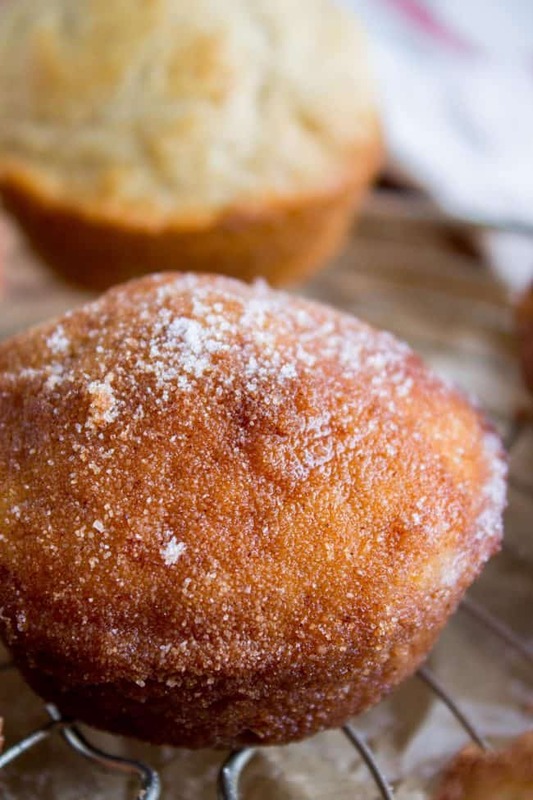 I imagine some cook in the Betty Crocker test kitchen feeling like ‘muffin’ was too common a word for these delightful things–“I know, I’ll call them a puff! A French puff, even!” Oh so fancy. 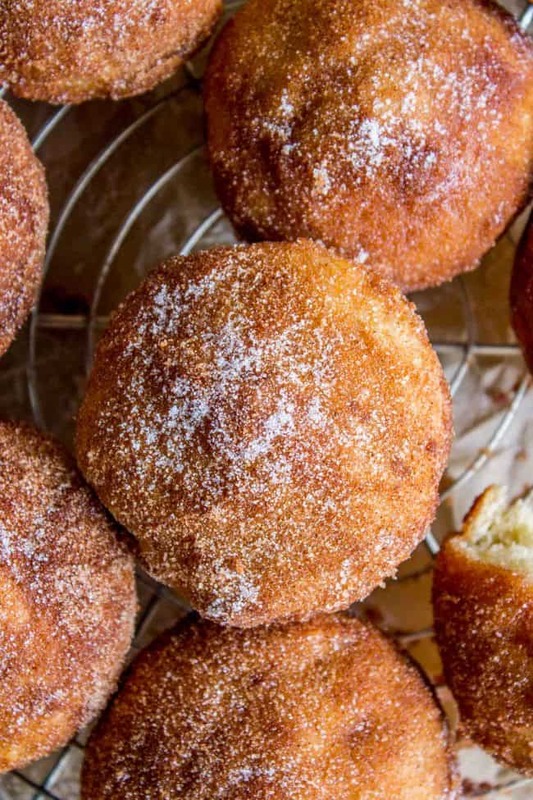 Honestly, these taste like doughnut holes but with none of the work (read: no frying). 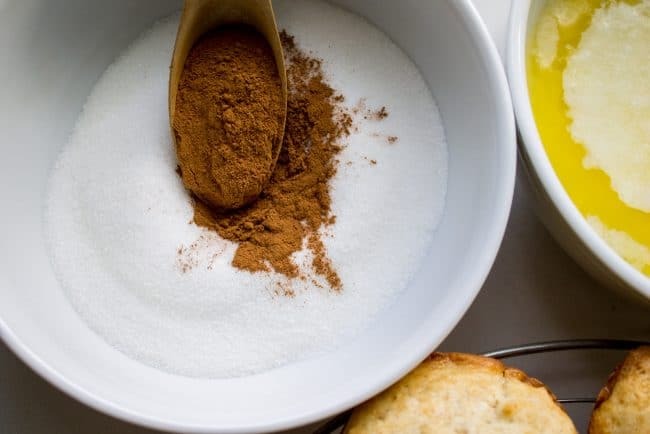 Because you are dipping the entire muffin in butter, it creates this delightful little crust, made even crunchier because of the cinnamon-sugar coating. It really does imitate that blessed outer-edge-of-the-donut-crackle. I’ve never made these as mini muffins before, but have heard that it’s delicious. I bet it would make them even more perfectly pop-able. The recipe as written makes 10 muffins; I imagine you could get 20-24 mini muffins out of one batch. P.S. Some exciting changes are coming to The Food Charlatan soon! I cannot WAIT to share! It will be several more weeks but stay tuned for updates and sneak peaks! 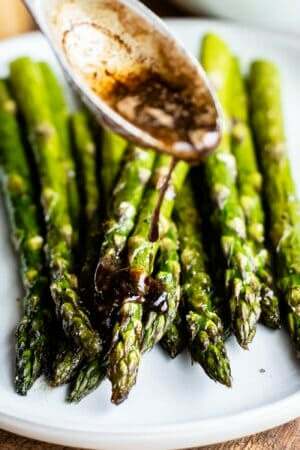 1/2	teaspoon nutmeg, use fresh if you have it! Beat in 1/2 cup sugar until fluffy. Add 1 egg and beat until smooth. Add 1 cup flour, baking powder, salt, and nutmeg, but don't stir. Use a small spoon to stir the dry ingredients together, and then gently beat the dry ingredients into the wet. Before the flour is fully incorporated, add the milk. Beat until almost incorporated. Add the 1/2 cup of flour. Beat very gently (or use a spoon) to mix until everything has just barely come together. 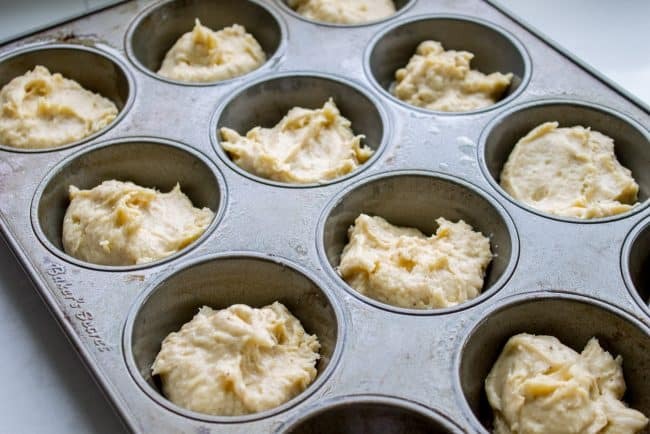 Use a spoon or small measuring cup to divide the batter between 10 greased muffin tins. Bake the muffins on the center rack for about 20-23 minutes. The tops of the muffins will just barely start to be golden when they are done. You can also insert a toothpick into the center of a muffin, and if it comes out dry, then they are done. When the muffins have cooled for a couple minutes, use a knife to release the muffins from the pan. Remove to a cooling rack. Melt 1/2 cup butter in a small bowl. In another small bowl, stir together 1/2 cup sugar and 2-3 teaspoons cinnamon (to taste). When the muffins are cool enough to handle but still hot, dip each one in the butter (all of it! Top and bottom!) and then roll it in the cinnamon sugar. Some people say you should just dip the tops of the muffins. Those people are wrong. 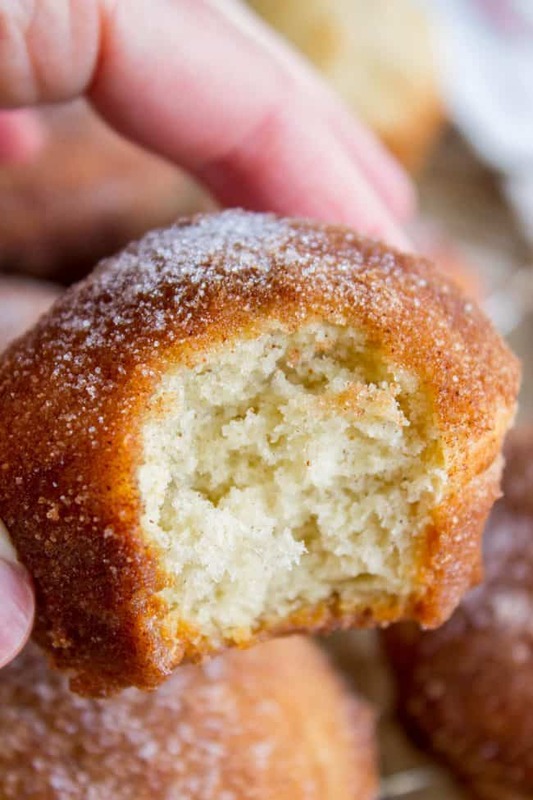 You can totally make these in a mini muffin pan. I would guess it would make between 20-24 mini muffins. You will have to take a guess on the baking time, it will definitely be less time, start with 10 minutes. They are done when they are golden on top. Source: I adapted this from Betty Crocker. 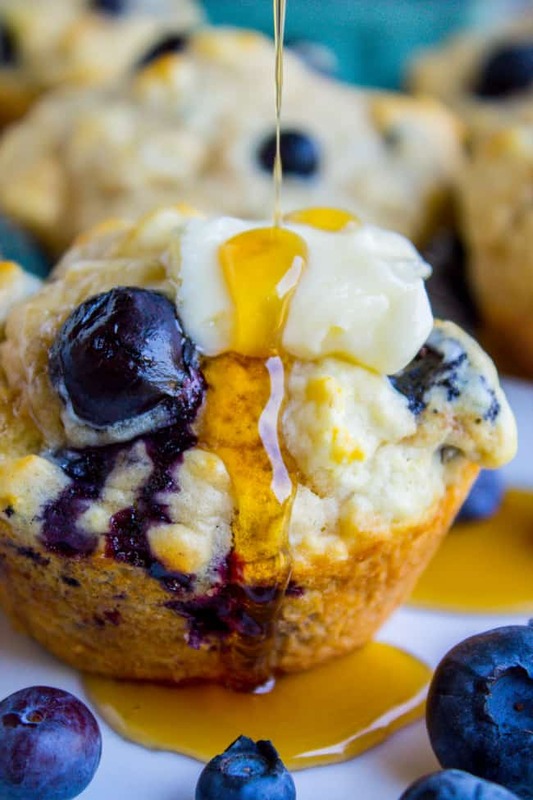 More muffin recipes to love! 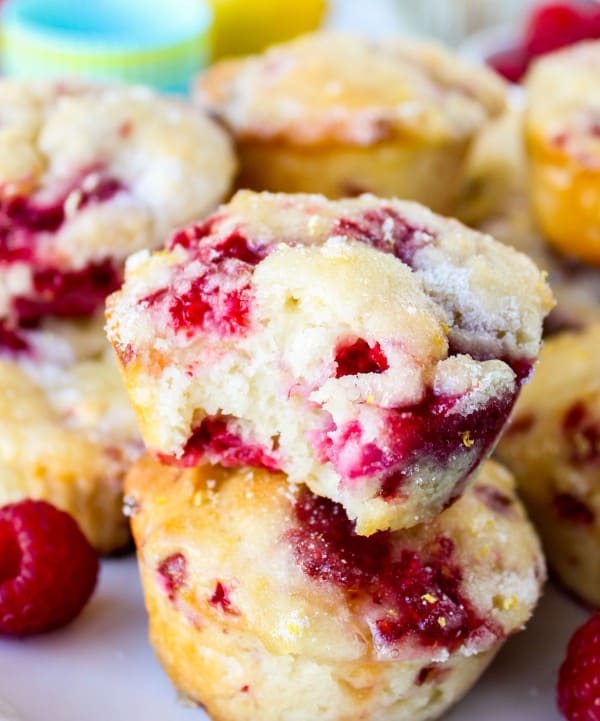 Raspberry Lemon Glazed Muffins << these are perfect for spring! 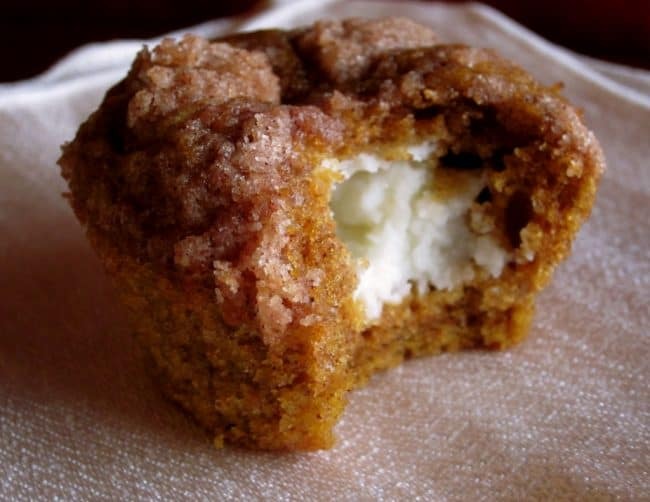 Pumpkin Cream Cheese Muffins << These are such a popular recipe! 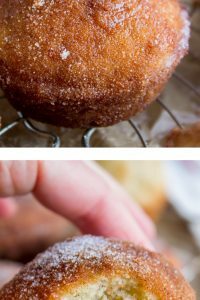 Other recipes for “French” Breakfast Puffs! 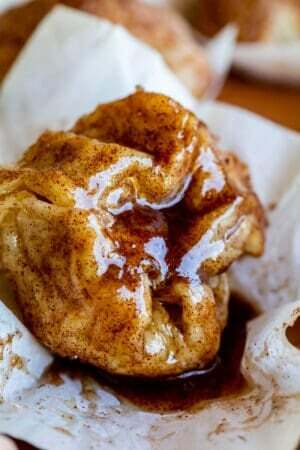 Cinnamon Brown Butter Breakfast Puffs from Smitten Kitchen <<neeeed to try this with browned butter! I CAN NOT WAIT TO MAKE THESE. WILL TAKE FOR THANKSGIVING TO MY DAUGHTERS. 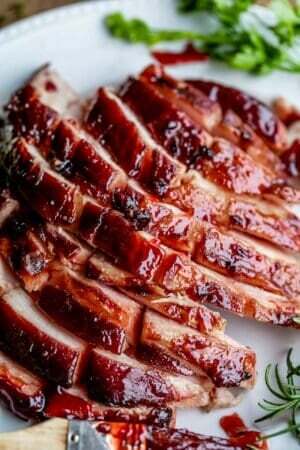 I WILL BE THERE 3 DAYS.THANK YOU FOR THE RECIPE. I bet your daughters will love them Wanda! Tell me how it goes! Hey don’t knock Crisco too hard, I love going half and half with butter in some recipes!! But all butter is def better when you’re eating the dough :) Thanks for stopping by Krystle! Yes, we made something similar to this is Home Economics but had no idea it’s called Snickerdoodle muffin. Love the name. It’s intriguing and interesting. Would love to make a fresh batch this weekend. Thank you for sharing this brilliant idea. Not sure I’ve ever made these, but now I really want to!! Perfect for when you’re crying over spilled milk. We make these quite often, but I put a tsp. of raspberry preserves in the middle (little batter, tsp. jelly, more batter) and they make like little jelly filled cake doughnuts! Soooo good! I love your stories of motherhood. They speak to my soul. 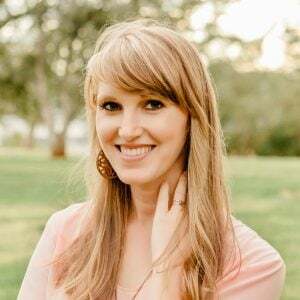 I have been struggling to feel like I get anything done but between 4 kids, 2 of which I homeschool, if I’m still standing at the end of the day, it’s a win. Oh my goodnesssss!!!! Like a jelly doughnut! That you made at home in 30 minutes and didn’t have to fry!!! You my friend are a genius. MAJOR props to you on homeschooling, I would have such a hard time managing that! Thank you so much for reading, and for telling me you like my stories! Seriously means so much to me. Soldier on, mother warrior! Ooh I’ve never made them but need to now! I made these all the time for the kids for breakfast growing up. I had a Better Homes & Garden’s Quick Breads Cookbook that I used so much it fell apart and all the pages are stained with butter and batter. These are delicious and so easy! Thanks for posting Karen! I should have known you would already have this recipe Kris! I hope you get to make them soon!! I love your recipes! 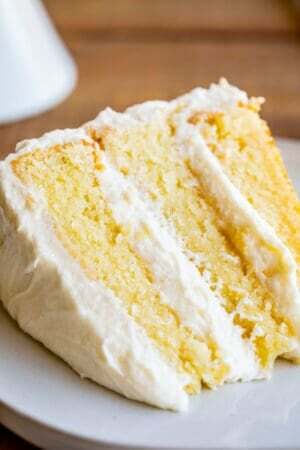 They are always very easy to make with ingredients i already have in my pantry. And always delicious! 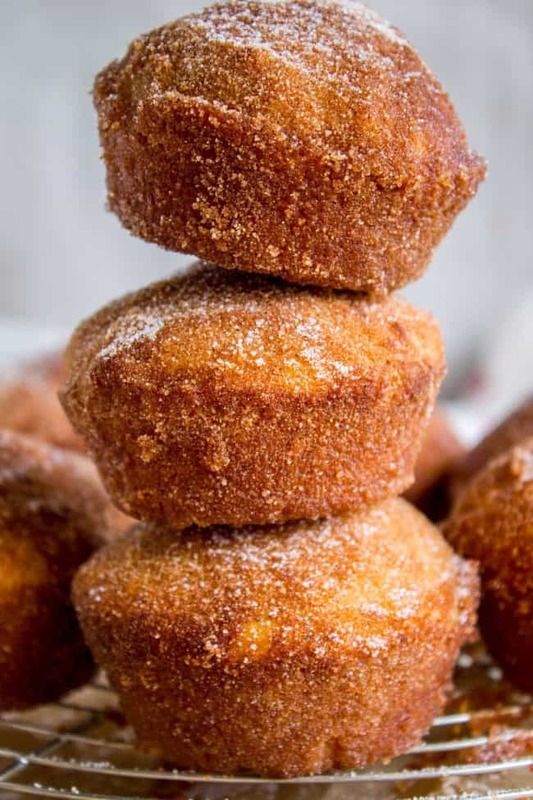 These Snickerdoodle Muffins (French Breakfast Puffs) are no exception, they are to DIE FOR! So easy, so delicious. Even my picky eating husband loved them. I used almond milk instead of regular, and they turned out just fine. I’m definitely making these the next time i have guests for brunch! Thanks Lorinda! I’m glad you enjoyed them! I just made these yummy muffins!! Loved them! My family did too! Will for sure make them many times more! I’m so happy you got to try them out Debbie! 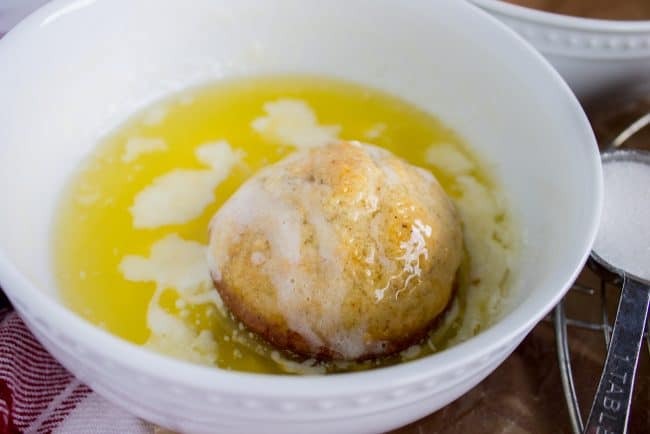 Who doesn’t love a muffin dunked in butter, right :) Thanks so much for sharing your review! !